Volume 14 of the "Qualitative Psychology Nexus" presents selected contributions to the 17th workshop of the Center for Qualitative Psychology, which was held from April 1st-2nd at the University of Jaén, Spain. Karin Schweizer from the University of Education at Weingarten, Germany, the president of the association "Center for Qualitative Psychology, and the communication chair Tiberio Feliz (UNED, Madrid) were assisted in organizing the meeting by Eufrasio Pérez-Navío and the other members of the Spanish organization committee, José Antonio Torres González, Javier Rodríguez Moreno, Raúl González Fernández, Blas Campos Barrionuevo, Ernesto López Gómez, José María Santoro Moreno, Sálvora Feliz Ricoy, José Carlos Cabrera Linares y Benjamín Mejías Ibáñez. 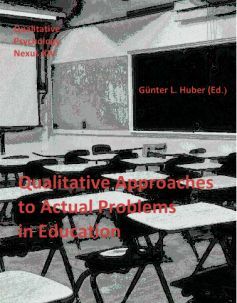 "Qualitative Approaches to Actual Problems in Education". The contributions to this topic are arranged in this publication in two main sections. The first part deals with general methodological considerations, the second part presents answers to actual educational questions. Children's Inconsistent Answers to the Language Learning Strategy Inventory: Are Introspective Questionnaires useful in Research with Children?